Born in Ireland, Feargal graduated from University College Dublin as an electronics engineer. He moved to England in 1994 to take up a commission as a weapons engineer officer in the Royal Navy's Submarine Service. Following a training course in the Highlands, Feargal requested a transfer to Scotland and Glasgow became his home. He has lived in the Victoria Park area for the last 20 years, currently living in Whiteinch. Retiring from the Armed Forces in 2010 as a lieutenant commander, he retrained as a physics teacher, still teaching two days a week. Married with three children who attend local schools/university, he is acutely aware of the pressures of family life. 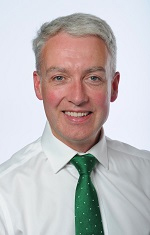 Feargal is the City Convener for Workforce and chairs the Glasgow City Council Workforce Board. He also chairs the Victoria Park Area Partnership and is a member of the Fossil Grove Trust. View Outside Body Membership here. View Register of Interests here.